Fall camp is underway, and things have slowed on the recruiting trail. The Oregon coaching staff is now focused on developing the current roster in preparation for the upcoming season. We know, however, the recruiting game never fully stops in college football. 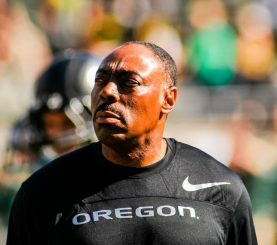 Just over a month ago, the Ducks picked up verbal commits from a pair of four-star athletes in linebacker LaMar Winston (Portland, Ore.) and defensive back Jared Mayden (Sachse, Texas). The Ducks currently have 14 verbal commits for the 2016 recruiting class. However, the class is far from complete, and there is much more to look forward to on the recruiting trail. Question 1: With four-star linebacker Bryce Youngquist verbally committing to Oklahoma in early August, what is Oregon’s plan for replacing the lost talent? All things considered, linebacker is the biggest need for the Ducks in terms of depth for the future. Oregon will have to reevaluate its strategy for the position following Youngquist recanting on his verbal commitment. But what does this mean? The Ducks have existing offers extended to several elite linebackers from all across the nation — while some of those players are considered long-shot signings, things could change when those young men see the impeccable facilities Oregon has to offer. Youngquist would have been the third four-star linebacker to join the Ducks’ 2016 class, but now Defensive Coordinator Don Pellum must adjust accordingly. According to Justin Hopkins of 247sports, “Elite players like Caleb Kelly, Mique Juarez or Michael Divinity are no-brainers. If those guys want to commit, they have a spot.” This is true for a lot of Oregon targets as of right now; the Ducks have thrown their hat in the ring for several top-ranked players, and now they are waiting to see what happens. Just as De’Anthony Thomas changed his mind from USC to Oregon at the last second, nothing is official until enrollment papers are signed. Aside from stealing a top linebacker prospect, Hopkins reports that several prospects “will now remain under review.” Also, it’s likely the staff will take some time to re-evaluate, and might even wait a few months before acting. As Hopkins states, “There tends to always be a late bloomer or two,” and there are certainly players who could catch the eyes of the Oregon staff as their seasons progress. The Ducks have two linebacker commits in the 2016 as of right now in Winston and Darrian Franklin (Downey, Calif.), but will need to replace at least eight players at the position over the next two years. With linebacker being such a big need for the Ducks, stay tuned for any updates as the season gets underway. Question 2: What other positions need to be filled, and how will this class end up when everything is said and done? Don Pellum still has holes to fill on the defensive side of the ball. The 14 verbal commits for 2016 by position are as follows; QB: 1, RB: 1, WR: 2, TE: 1, OL: 2, DL: 1, LB: 2, DB: 4. Looking at that list, and the current roster, it seems the Ducks are likely done at defensive back for this class. Oregon’s 2015 roster was full of freshmen and sophomores in the secondary, so it’s safe to assume that attention will be focused elsewhere. Do keep in mind that Nigel Knott, the No. 6 corner in the nation, is still weighing his options. 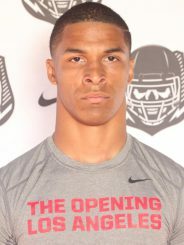 If he chooses to come to Oregon, head coach Mark Helfrich and staff will gladly welcome him. Moving forward, the Ducks will need to address the defensive line as a whole. Ideally, they will land commits from two more defensive lineman in order to help add depth to a unit that will lose Alex Balducci, Tui Talia and potential Top-10 NFL Draft pick DeForest Buckner after the 2015/2016 season. 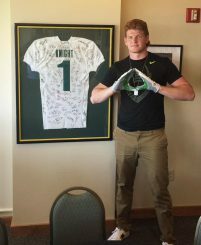 Connor Murphy during his visit to Eugene. The Oregon coaches have done a great job finding players who fit their system, and with one verbal commit already, the Ducks are in a decent position to add defensive line depth as the season progresses. One guy many Oregon fans would like to see in a Ducks uniform is Connor Murphy (Phoenix, AZ), a 6-foot-7, 235 lb. defensive end boasting 10 offers so far. Murphy has the ability to rush off the edge, or play outside linebacker, much like Dion Jordan. On the offensive side of the ball, the Ducks recently made the cut for two talented big men. The first, offensive guard Michael Alves (San Diego, Calif.), listed his Top 5 on July 29 and Oregon appeared along with Wisconsin, Washington, UCLA and Boston College. The other potential lineman, and junior college transfer-to-be, is tackle Gerett Bolles (Lehi, Utah). Bolles released his Top 7 on July 28, and the Ducks joined Auburn, Arizona State, Georgia, Ole Miss, Utah and Arkansas as the finalists. Last year, the Ducks’ recruiting class brought in 22 players, and finished with the No. 16-ranked class in the nation according to 247sports. Fans can expect a similar number of signees in the 2016 class, but the talent level thus far warrants the following thought: Could the 2016 recruiting class be the best in Oregon history? There are several storylines to closely monitor and even more that will develop as the season gets underway. Stay tuned to FishDuck.com all season as this class continues to take shape. As always, special thanks to Duck Territory at 247sports.com for sharing this information with FishDuck.com.